Congratulations on your upcoming marriage! The Central Coast of California is a beautiful location for a wedding. The wedding ceremonies I offer are planned together with the bride and groom. I truly want the ceremony to reflect who the two of you are. The ceremony can be formal to informal, religious to less religious. Above all, I make the ceremony personal to the bride and groom and so, I very much enjoy getting to know each couple and to hear their story. Together, we design the celebration so that the ceremony is authentic to the two of you. Please have a look through my website, and don't hesitate to contact me with any questions you might have! I hope to speak with you soon, let's begin planning your special day. I am a Lutheran pastor with over 30 years experience and have officiated in hundreds of weddings. San Luis Obispo has been home for more than 20 years and so I know the area very well. I have also worked closely with many of the local vendors, DJ’s, and wedding photographers, and I would be happy to make any recommendations for you if you need. In addition to being a pastor, I am a licensed marriage and family therapist. I have been happily married myself for 37 years, which I can tell you marriage in itself is the greatest of life experiences. I look forward to working with you on your Central Coast wedding. 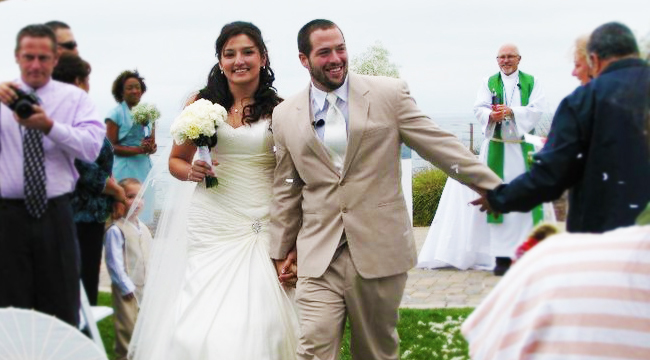 “We just want to extend another thank you for officiating our wedding and working with us and our requests (ie. your attire and our time crunch). Everything turned out just the way we hoped it would. “You definately made the ceremony part of our wedding worry free, and the counseling sessions were much less frighting than I had imagined. “I just wanted to thank you for performing the ceremony. I was in a fog that day, but just saw our wedding video, and got to relive the experience all over again. You did a wonderful job! My Grandma liked the ceremony so much that she told her minister and would like him to consider doing wedding ceremonies the way that you did. drop me an email through the contact form below. I look forward to speaking with you, and to planning your wedding here on the beautiful Central Coast of California. It will truely be a day you'll never forget as husband and wife. My fee is $400 which covers getting together as often as the bride and groom want, the premarital counseling sessions (if the couple so chooses), unlimited access by phone or email, the rehearsal, and the wedding itself. I also mail or hand deliver the completed marriage license to the county registrar. Tell us more about the premarital counseling sessions? This is optional, of course, but most couples I do weddings for take advantage of premarital counseling. While couples are very busy getting ready for their special day, I also want to help couples understand what makes for a healthy relationship in their lifelong commitment to one another. I use materials called Prepare which millions of couples around the country have taken. Prepare helps to measure relationship strengths and growth areas. Of all the couples who have taken Prepare, every one said they gained from the experience. Do the premarital counseling sessions cost extra? No. I believe so much in preparing the couple for their married life together that I do not charge extra for premarital counseling. In a way, it is my gift to you. There is a $30 processing fee which is paid when accessing the Prepare inventory online. How often would we need to get together? As often as you would like. Planning the ceremony usually takes 1-2 sessions. Premarital counseling usually takes 1 – 2 sessions. We live out of the area and can make it to the Central Coast only a limited number of times before the wedding. How would we make that work? This is a common occurrence. Whatever works best for you works best for me. For those sessions when we can get together, we can double up on the time. We can also dialogue as much as possible via email or text or skype. We have some special requests for our ceremony. Is that okay? Of course. I would be happy to accommodate your requests and needs as much as possible. Where do we get the marriage license? You can get the marriage license from the San Luis Obispo county recorder’s office or, if you live outside of the county, from your own county recorder’s office, whichever is most convenient. Go to their website so you will know what you will need to bring in to apply for the marriage license. 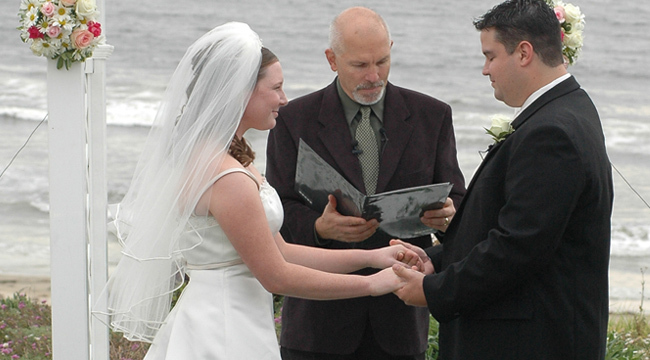 What are your qualifications as a wedding officiant and counselor? 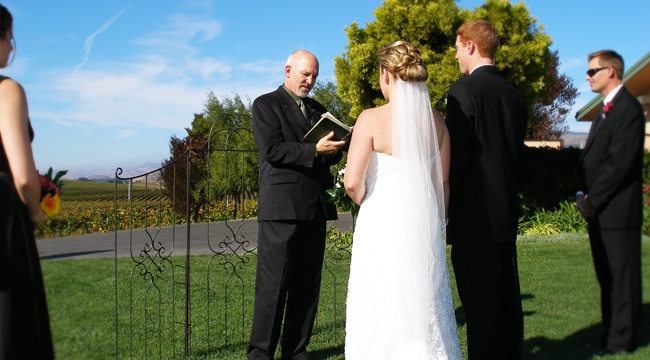 I have been a pastor in the Lutheran church for over 30 years and have officiated at hundreds of weddings. I am also licensed as a Marriage and Family Therapist (lic# MFC51798).